This is Part 5 - Making a carry crate for a breedable pet in Second Life. Your birds cannot live in your inventory. They must be carried in a crate. A crate is just a prim with a script and a copy of the egg and the bird in it. Cryo-crates and egg cups should be given out for free. 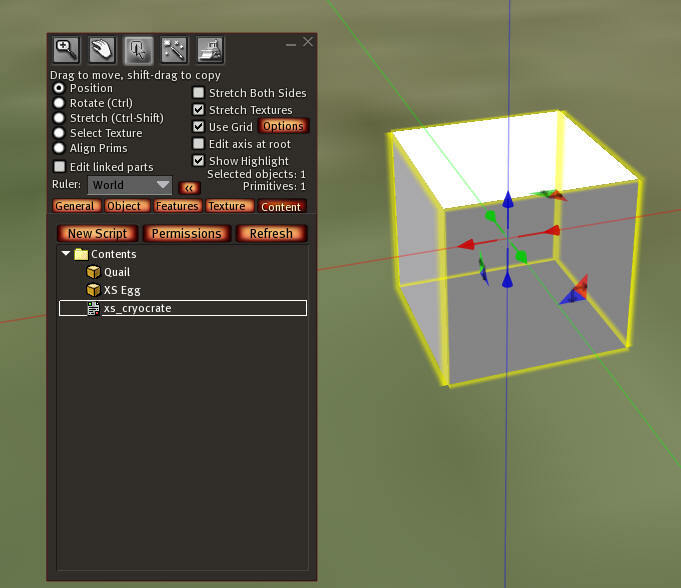 Rez a cube and name it 'XS Cryo-Crate: Quail'. Change the texture to None. Put a copy of xs_cryocrate in the transport crate. Put a copy of the XS Egg and Quail from your inventory in the crate. Now you can take it back to inventory.